HAPPY HOLIDAYS TO ALL OF YOU! I'm thrilled to know that my blog posts are read, and hopefully enjoyed. Thanks to each and every one of you and my wishes for a happy and healthy 2012. Our Christmas Gifts are wrapped - or placed carefully in gift bags and stockings I made for our grandchldren over many years. And the table is set for Christmas Eve dinner with our NYC children, our grandchildren and my 92 year old mother. We will miss our DC grandchildren and their parents! 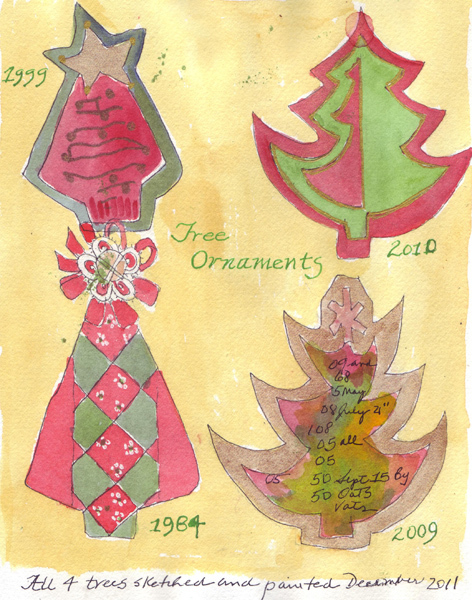 I'm still adding drawings to my Ornament Sketchbook and uploaded my pages of Christmas trees and reindeer today. 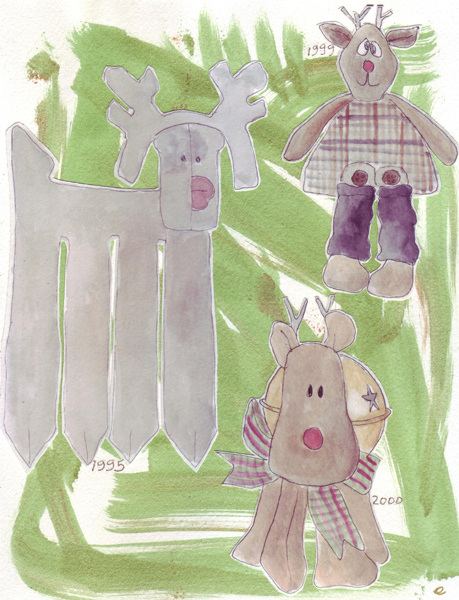 Several weeks ago I received a comment on my blog asking about the Jingle Bell Reindeer. The writer received one of these as a gift many years ago and was looking for the pattern without success. When she put all the correct words in Google, she found an image of one of my ornaments from an earlier blog post. I was able to provide her with pattern details, and hopefully she finished making all of hers for friends and family this year. 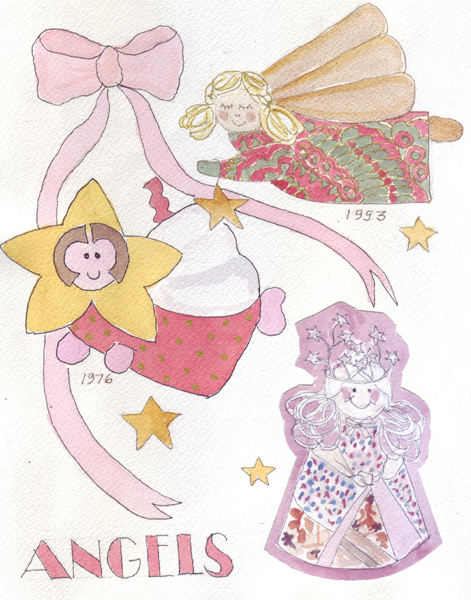 In 1976, the year after our 3rd and last child was born, I started to make fabric ornaments for our Christmas tree. I usually made 20-24 of the same ornament so I could give some away as gifts. And over the years I made several more for our family when I found a new pattern, design or needlework technique (for example smocking or silk ribbon embroidery). After giving away 3 full sets of the ornaments to our children, when they were married, I still have 139 hanging on our tree. 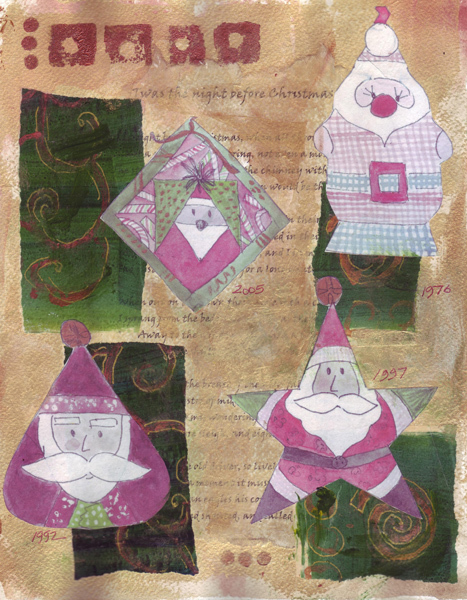 Each of the last few years I sketched and painted random ornaments in my daily watercolor sketchbook during the holidays, and then last year I decided that I would make a mixed media artist's book of my favorites. 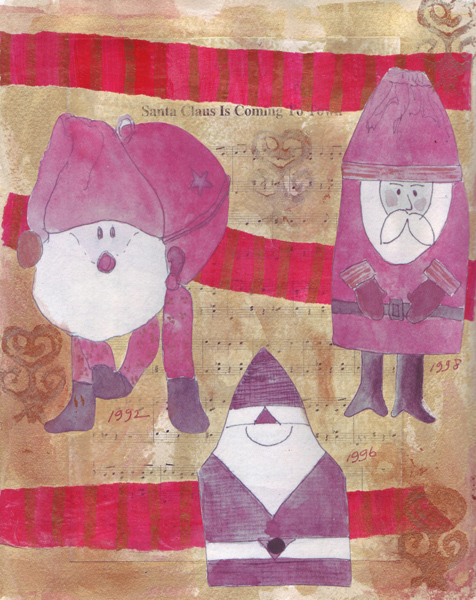 So I am scanning and printing some of the ornaments from my sketchbook pages and collaging them into the book. And on other pages, I'm drawing and painting them directly on the pages in the 8 x 10" watercolor book. Here are 3 of the first pages. This will be a long term project for the last two weeks of December each year. 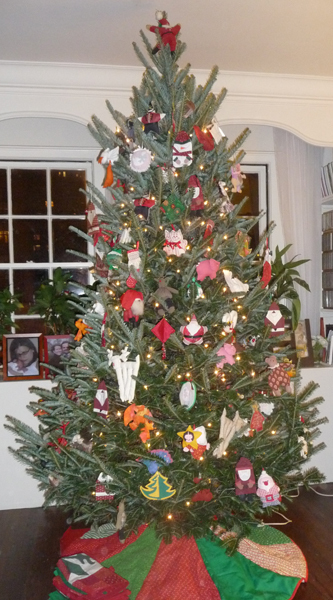 Once we take down our tree and pack up the ornaments, they will be forgotten until the next year. 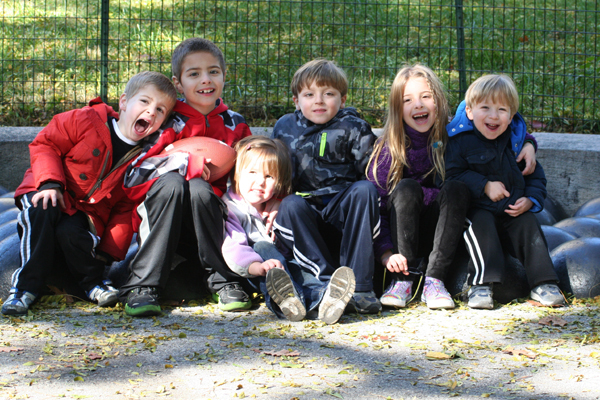 We love being grandparents and last month got one of our annual photos of our 6 grandchildren - ages 2-8. 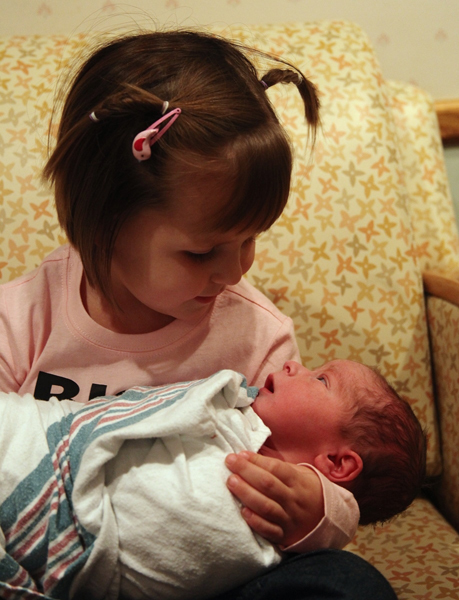 Last night Annabelle welcomed a new baby brother. And now we have 7! We are thrilled! HAPPY HOLIDAYS TO EVERYONE FROM OUR HOUSE TO YOURS. I'm still not brave enough to "draw" a figure with my paintbrush. Oh well! This can be one of my goals for 2012. Here are 6 drawings from the 18 I did last evening. I don't like the specific male model who posed last night, so all of my drawings were done of the woman model. 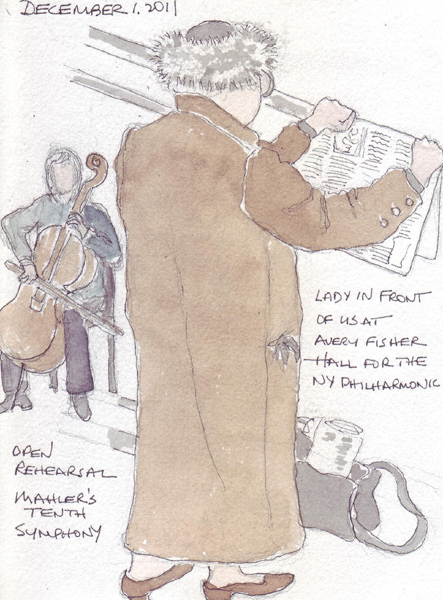 My husband and I went to an open rehearsal of the NY Philharmonic to hear Mahler's 10th Symphony - and I sketched the lady who was in front of me on line (reading her NY Times which was hung over the glass partition) and the cellist who was warming up on stage. Lovely concert which is scheduled for more performances tonight and tomorrow night.